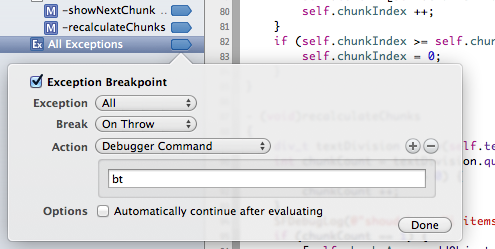 Apple is undergoing changes in the low-level foundation of iOS and the Xcode debugger, which is now officially LLDB. My guess is that Apple has still some issues with reporting errors, but fortunatly, this issue is easy to solve. By default, it will revert to ‘All’ as the exception to catch and edit. Set the action to ‘Debugger Command’ if it’s not already selected, and set the empty text field to ‘bt’, which is the command which prints the current stacktrace on the current thread. There now, when you have an unhandled exception thrown, your debugger will show you a nice backtrace and a reason for throwing the Exception!